Early this morning, Mercedes GP unveiled their new F1 car for the 2010 season. 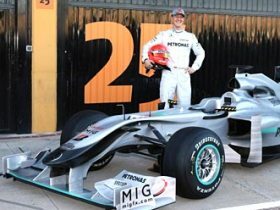 The relatively small launch in Valencia, by none other than Michael Schumacher and this seasons team-mate Nico Rosberg marked the start of official testing at the Circuit Ricardo Tormo this morning. The 2010 car is a far cry from the 2009 Brawn car, with a longer body (to accommodate more fuel), a new nose cone (similar to the 2009 Red Bull nose) and a newly designed wing over the engine cover. We hear that Rosberg will be the first, with Shuey taking over this afternoon. Overall the session will last 3 days, and is the first of four testing sessions before the season opener on 14 March in Bahrain. Not all of the teams are ready for the first test session, with Red Bull missing for certain. Also we don’t expect to see Button or Hamilton, although we expect McLaren to be at the event with reserve driver Gary Paffett. Tactics may be playing a part, but surely drivers want to maximise their time at the wheel?